From powder through to the end product. 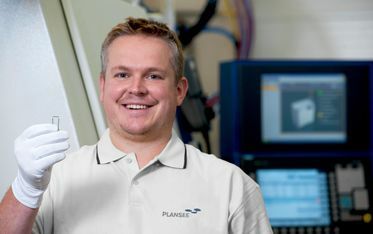 At Plansee, we use our own plant and machinery to manufacture our products: We monitor every production step from the manufacture of the material through to the complex finished component. Only in this way, can we fulfill our commitment to outstanding quality. We use powder metallurgical methods to manufacture our refractory metals and composite materials. To make sure that nothing is left to chance, we start at the very beginning: We reduce exceptionally pure molybdenum oxide and tungsten oxide to obtain pure metal powders. In this way, we can guarantee that the material we produce is unsurpassed in its purity. 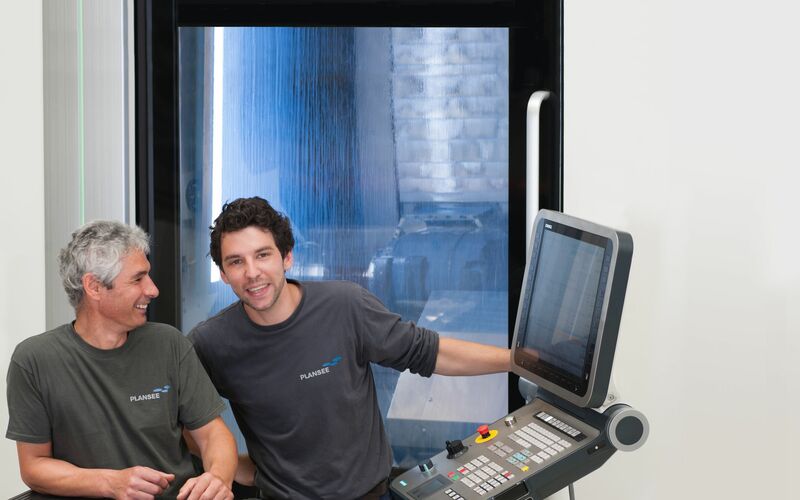 From our computer-assisted design processes through the highly automated production methods and on to our high-precision testing equipment, we rely on our accumulated in-house expertise. When working with refractory metals, extensive experience is crucial. The most compelling proof of this: Plansee's engineers develop the furnaces that we use for our own high-temperature processes. We also manufacture most of the tools we use in our pressing, punching, bending and forming systems ourselves. Powder metallurgy is constantly growing in importance and is set to be a key technology of the future. This method of manufacturing exceptionally pure molybdenum and tungsten combines great economic efficiency with a low level of resource consumption. In addition, powder metallurgy makes it possible to produce alloys and composite materials in which the distribution of the individual components is exceptionally uniform. And there's one more advantage: Tailor-made powder mixes make it possible to produce a wide range of alloys - compared to the use of melting processes, customer-specific material combinations are economically viable even when manufactured in small quantities. Our engineers and designers are continuously designing increasingly efficient product solutions. They work closely with our customers and keep track of any new developments that emerge.Our specialists will provide you with expert advice on all your questions relating to the selection of materials and production possibilities and will help you during the development of the product specification. In our global network of 12 production sites, we place special emphasis on knowledge transfer within the company. In this way, we can ensure that our customers are able to benefit from the entire engineering expertise we have amassed over the last 90 years. A semi-finished product sounds simple. Not when refractory metals are involved. The special properties of our materials such as their high thermal stability and hardness place exacting requirements on our forming processes. All our experience goes into forming the sinter blocks using our forging, rolling and drawing processes. The right temperatures are essential. During operation, Plansee components are often exposed to very high temperatures. Great experience and care are necessary to ensure that our materials continue to exhibit outstanding mechanical stability and strength even after forming. We adjust the forming temperatures extremely precisely and take the time to perform various additional operations such as intermediate annealing. 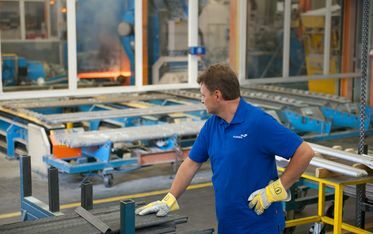 Plansee forges its rod products on state-of-the-art radial forging machines - accurate to specified final diameters and to very narrow tolerances. The benefit to you: The forged surface and the microstructure guarantee optimum mechanical properties across the entire rod cross-section. Thin rods and the input material for wires are produced using continuous rolling processes. This so-called groove rolling method ensures that the product possesses the optimum properties for subsequent machining processes. Coarse and fine wires are then drawn from this rolled material. We control the temperature extremely precisely and form the wires using diamond and hard metal tools on modern wire drawing systems to produce exceptionally smooth, uniform wire. On different rolling mills we produce sheets in thicknesses between 15 μm und 50 mm. Among others, we operate the world's largest hot rolling mill for refractory metals. It has a force of 50 000 kN (kilonewtons). We use forging and drawing techniques to manufacture tubes with a high density and homogeneous. Refractory metals can be worked very successfully providing that the employed forming and machining methods are adapted to the specific behaviour of the material. Plansee has been forming and machining refractory metals since 1921 - nowadays, we produce components of every dimension: the smallest product weighs two grams and the heaviest approximately five tonnes. Supplied with the perfect finish: We perform chemical, galvanic, thermal and PVD coating on our own plant. In addition to professional cleaning, degreasing, etching and electropolishing, we will also supply your product with the required coating. From gold, silver and nickel through to ruthenium, chromium, aluminium and many other coatings. High-temperature materials for high-tech applications demand special joining technologies. Thanks to our many years of development work and experience, joining technology now counts as one of our important core competences. We can handle complex welding tasks involving materials offering different levels of weldability either in-house (laser welding) or in cooperation with external partners (electron beam welding, friction welding). We would be happy to examine the welding properties of new materials for you and evaluate special welding processes for components exposed to high loads.